Material: Organza. 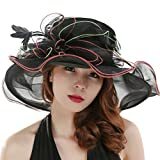 100% Polyester.Wear to Church, Twenty’s Parties or Gatsby Picnics.drawstring adjuster inside.Church hat, Wedding hat, Kentucky Derby hat cap, floral organza Hat, Lady hat, Sun hat,summer hat, beach travel hat. provide a unique designed new look for ladies with its beautiful decorations: floral items, diamond casings, stones, feathers, mesh. pearl. ect. Fresh adding in the summer and warming keeping in the winter. Elegance and royalty added to you for all seasons. Interior adjustable draw string, will accommodate 54-57.5CM/22inch-23inch. Perfect for everyday wear a fancy event, Outdoor tea, Kentucky Derby, Grand National, Melbourne cup, wedding, church or eligious gatherings. Great for ladies, and teens and girls.